My cross-national identity and international actions reflect the values of global citizenship. Driven by a strong sense of urgency for peace, justice, dignity and human rights I reflect myself in the words of Thomas Paine, one of the American founding fathers, saying my country is the world and my religion is to do good. Internationalization is a process visible in academia and reflecting the attempt to cope with globalization while preserving national identities. Dr. Marco Tavanti has been involved in this process at DePaul University and other academic institutions. As global citizen at heart and dual national (USA and Italy, EU), Dr. Tavanti embraces both the idea of "international-by-design" and "international-by-practice." Over the past 25 years, Dr. Marco Tavanti, worked, volunteered and collaborated with a number of international organizations, non-governmental organizations, and worldwide academic institutions engaged in poverty reduction, sustainable development, capacity building and human rights. Here is a partial list of international organizations and programs developed, founded or assisted by Dr. Tavanti. Numerous mentors, colleagues and collaborators have been instrumental in inspiring and forming Dr. Tavanti's international activities, philosophy of engagement and commitments to international development. The following list of international organizations, international programs and initiatives include academic-based international public service works around the world. Dr. Marco Tavanti is President Emeritus and co-founder of the World Engagement Institute (WEI or WEInstitute). The WEInstitute is a multi-disciplinary and academically-based non-governmental organization (NGO) providing international sustainable capacity trainings worldwide. Registered as a nonprofit corporation in the state of Illinois, United States, the WEInstitute provides a unique sustainable model for capacity building centering around academic institutions for increasing community, organizational and institutional capacity. Through a large network of senior , mid-level and junior professionals engaged in international development, the WEInstitute associates offer a variety of collaborative assistance for improving human rights, sustainable development and organizational capacity among selected nations in transition. In short, the mission of the World Engagement Institute (WEInstitute) is to connect professionals with universities and international organizations for the development of globally responsible leaders and sustainable communities worldwide. The Sustainable Capacity International Institute (SCII or SCIInstitute) is a European based international non-governmental organization registered in Italy as a nonprofit organization for social benefit (ONLUS). Through a large pool of professionals from academic institutions, international organizations and non-governmental organizations, SCII provides competent assistance for building sustainable capacity in institutions, organizations and leaders engaged in nation building and social human development.The mission of the Sustainable Capacity International Institute (SCII) is to cooperate for the development of institutional and professional capacity in the fields of human rights and sustainable development benefiting nations in economic and political transition. Dr. Marco Tavanti and other international development professionals founded the SCIInstitute in 2011 to have a European based organization collaborating with the World Engagement Institute and other international partners in providing competent capacity development services to transitional and post conflict societies. In 2003, Dr. Marco Tavanti designed a specialized Master degree focus on management of international NGOs called Master of Science in International Public Service (MS-IPS) at DePaul University's School of Public Service. It offers the essential education for a long term career in international development. Dr. Marco Tavanti chaired the degree until his departure from Depaul University. The IPS degree program offers students the essential management skills and leadership competencies to effectively engage in global, international and intercultural contexts. Many of our students are returning Peace Corps volunteers or committed 'global citizens' committed to make a difference in the world through human rights advocacy, poverty reduction, sustainable development, international cooperation and NGO management. Through practical learning, service to international organizations, teaching by expert scholars and mentoring by seasoned practitioners the admitted students benefit from a rich and diverse environment in the global city of Chicago. The program gives a balanced education on international theories and practices for non-government or intergovernmental careers dedicated to international sustainable development. The Sustainable International Development (SID) site offers expert resources and organizational contacts on worldwide issues and possible solutions promoting sustainability and inclusive international development. It features expert interviews to Dr. Alfredo Sfeir-Younis and other leaders in the field of international sustainable development. Issues are explained, linked to resources, solutions and organizations. The site offers useful links for career opportunities in international development and green jobs. ​The Sustainable Chiapas Program focusses on the promotion and study of international sustainable development and indigenous human-rights. Since 1998, Dr. Tavanti's has been working in collaboration with various indigenous civil society, government agencies and academic institutions in Chiapas and Mexico. He continues his collaborative initiatives promoting indigenous rights, labor rights, cultural rights and sustainable development with fair trade coffee cooperative and other international organizations like Jubilee Economic Ministries . This site includes description of the programs and some former students reflections who traveled Dr. Tavanti in the highlands of Chiapas. ​The Program was developed by Dr. Tavanti in collaboration with Dr. Nesreen Akhtarkhavari, Director of the Arabic Studies at DePaul University. The mission of the program was to provide Public Service students with real world insights on humanitarian relief and refugee services. In collaboration with Jordanian Alliance Against Hunger, the program involved numerous governmental and international organizations including the International Human Rights Law Institute (IHRLI). Many of the partnerships and relations emerged in this program have been maintained by the World Engagement Institute. ​Dr. Tavanti has been collaborating with Adamson University in Manila, Philippines since 2005. The Manila collaborative initiatives focus on training young professionals in participatory research techniques for alleviating urban poverty and promoting urban sustainability. The program is a collaboration between DePaul University's International Public Service Program and Adamson University's Vincentian Center for Social Responsibility (VCSR) in Metro Manila, Philippines. ​On the 2009 Centennial Celebration of the Plan of Chicago and the Plan of Manila by Architect Daniel H. Burnham, Dr. Tavanti promoted various conferences and initiatives on urban poverty alleviation and urban planning for poverty reduction. In collaboration with the Chaddick Institute for Metropolitan Development, Dr. Tavanti and Liz Wilp promoted academic conversations comparing the values of Daniel Burnham and St. Vincent de Paul in the context of urban poverty reduction. The 'Big Plans Less Poverty' website includes additional resources and the projects elaborated by architecture students for urban renewal and urban planning for poverty alleviation. Dr. Tavanti and Liz Wilp created and promoted the competition in collaboration with the Arch. Jean Cornejo, Dean of the College of Architecture at Adamson University. The Global Ethics for Academic Engagement (GE4AE) is a community of academics and practitioners involved in international service learning and international public service. This is a forum designed to share principles and practices for academic social responsibilities in our local and global communities. The GE4AE is an initiative of Dr. Marco Tavanti emerged from values of academic social responsibility (ASR) and the shared concern for ethical cross-border higher education. As shared by the International Associations of Higher Education and expressed by UNESCI, cross-border education should strive to contribute to the broader economic, social, and cultural well-being of communities. This community emerges as response to the need of establishing a stakeholder dialogue for the formation of global ethical principle for academic engagement and global social responsibility. Read more at the GE4AE community site. 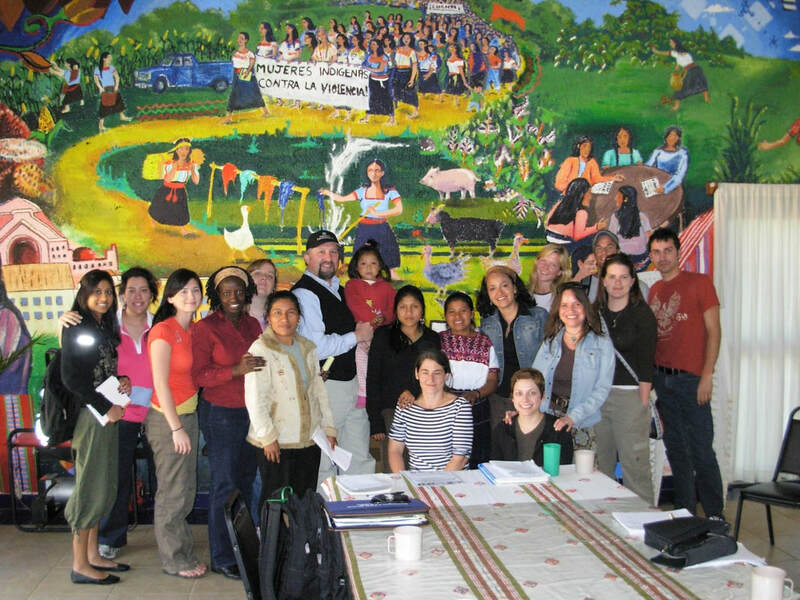 Dr. Tavanti and international sustainable development students visiting Kinal Antzetik an indigenous women social enterprise cooperative in Chiapas, Mexico (2007). Dr. Tavanti in front of the United Nations flag at the UN Headquarters in New York. 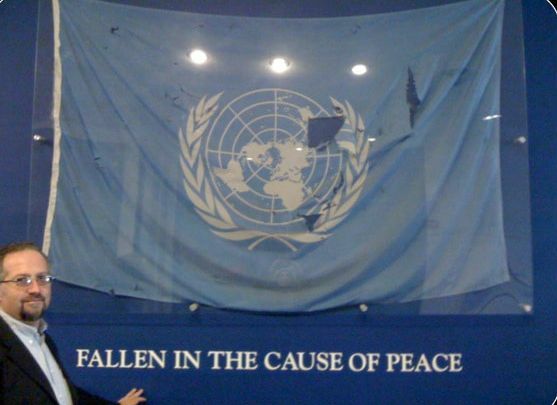 The flag was recovered from the bombing of the United Nations Assistance Mission in Iraq where Sergio Viera de Mello, one of the most inspiring international public service leaders, was killed in 2003.